Heritage Seedlings is the leading WHOLESALE propagator of deciduous, unusual ornamental trees and shrubs. We sell more than 500 varieties of unusual seedlings and an amazing variety of the latest, hard-to-find selections grown by grafting, cuttings, and tissue culture. 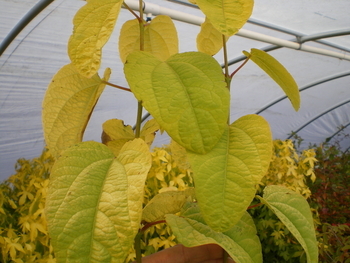 In addition to many unusual woody plants we have a strong emphasis on unique and rare maples, yellow Magnolias, rare Magnolias and new Magnolia selections from breeders. We also feature new dogwoods varieties, hard to find redbuds, liners, and rare grafts. Our selections are constantly being changed and updated. To view our current availability please go to Wholesale Ordering. The fruit of this beauty berry is more plentiful than any other . We would have counted them, but it would have taken too long! Clusters of purple berries cover the branches in fall, offering several options for use. Cut the stems to make exciting flower arrangements, or simply enjoy them in your garden as the days become shorter in autumn. Most often used as a rootstock for popular cultivars. Seedlings can be effectively used to create a hedge or screen and are favored in Europe for this purpose. Hardy to -38°F in Ohio during the extreme winter of '93-'94. Given no pruning, forms a dense, dwarf, upright tree . It is useful as a walkway or border focal point or as an edging feature. A diminutive hedge could be another landscape option, with the larger-than-usual buds adding to its winter interest. Rarely available in the trade still, but very easy to grow and zero maintenance required other than irrigation. An excellent ornamental because of its clean foliage, generally, upright growth habit, and adaptability. Branches ascend, but its form is not columnar in outline. It has a wide, round base and typically lacks a central leader. Similar to 'Fastigiata', but with slower growth habit and denser foliage. Its narrow columnar form grows to 40 ft. at maturity. The crispy serrated green leaves turn to gold in the fall, an attractive contrast to the smooth, gray bark. Much less congested branch structure than seedlings or the varieties 'Fastigiata' & 'Frans Fontaine'. Observant nurseryman Lanny Rawdon of Arborvillage in Holt, MO reports that it's a robust grower back in the Midwest, with a strongly upright form as a young tree. One of the first specimen trees set out by the late Buddy Hubbuch at Bernheim Forest is distinctly pyramidal in winter branch structure. Clonal propagation assures its predictable landscape uniformity, and Lanny tells us it survived -35 F in the harsh winter of 1983. This is a really tough, handsome tree for any landscape in zones 5-8 and for potentially harsh landscape conditions in the Midwest. Pest-free and widely adapted to conditions from the stream-side to the neighborhood mall. It's surprising the trade has not more widely embraced this American native. Fall color is an appealing mix of soft red, yellow and orange. Squirrels risk falling from the slenderest of branches to eat every possible fat, fertile seed in October. A seedling strain selected over many years by Mike Yanny of Johnson's Nursery in Menominee Falls, WI. for improved orange-red autumn color. 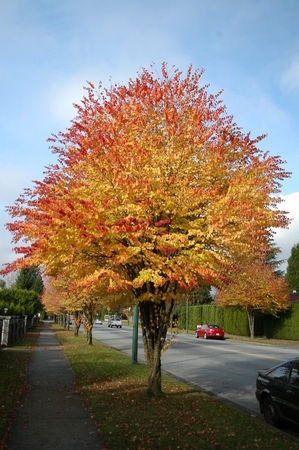 A small-scale (to 30 ft. x 30 ft.) tree with a dense canopy. Its leaf and bark characteristics resemble a small beech tree with fall color. Easy to transplant. 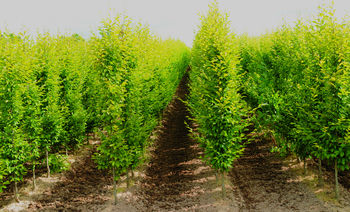 Use as rootstock for Firespire™ to assure grafted plants will survive in zones 3-4. For over 35 years Michael Yanny, Wisconsin, has been selecting and improving his native Musclewood. He started with a few trees that had some fall color and now he releases, with our help, the Wisconsin Red™ strain which has amazing fall color, so much so in fact, if you didn't know better you would suspect it was a different species. 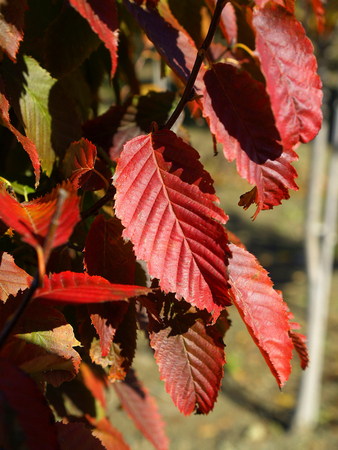 Raging reds, oranges and yellow autumn tones set this strain apart from normal seedlings and even his earlier work. Limited supply this year. 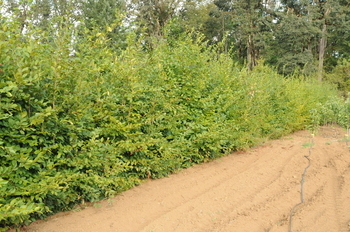 Small, rare species from Szechuan, China, to 20 ft. tall at maturity. 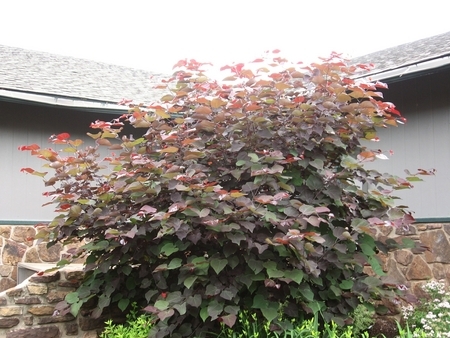 The ornamental appeal of this species is that its new growth is infused with an attractive purplish-red. Very choice. 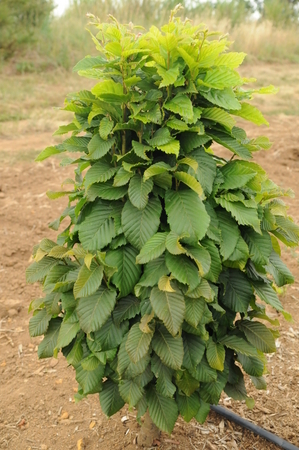 This hardy, medium-sized tree is truly distinctive. Heart-shaped leaves attract interest, changing from translucent bronze in spring, to summer green, to yellow and apricot-orange in autumn. Multi-trunked specimen trees with shaggy bark have eye-catching appeal. 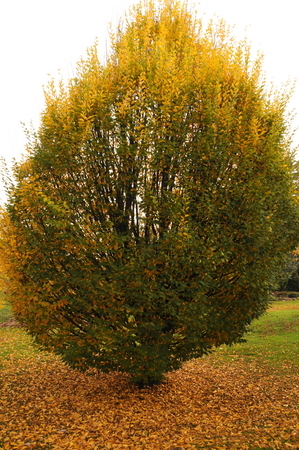 Throughout the seasons, it is among the most appealing of any hardy landscape tree. Dr. Mike Dirr names it his personal favorite. These liners are exceptional, with a strong central leader. Distinctively unusual, this katsura has golden summer foliage. The leaves emerge with a pink blush and unfurl to soft yellow. Throughout summer the more shaded leaves turn green, while those in sun remain yellow or turn almost white. Autumn yields the characteristic sweet fragrance and buttery golden color of the species. Best for a site with some late afternoon sun protection to avoid foliage burn, as is typical for many yellow-leaved plants. 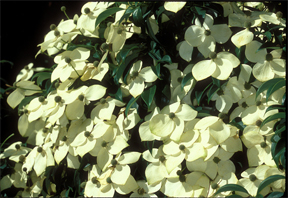 Widely adapted and often associated with Cornus florida in its native range. Bright pink flowers appear in the first warm days of spring; a delight after a long winter. An exceptionally attractive, relatively new introduction from TN. With so many new redbuds in the trade, we have to wonder when they will start to look like re-runs, but this is clearly a fine variety. Smaller in stature (12-15 ft. at maturity) than the species, its foliage is set on its branches with Vegas dealer-like precision. This one will grab your heart. 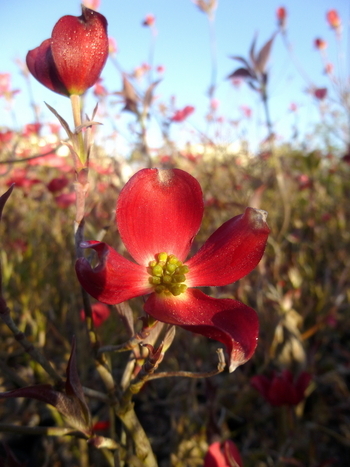 Some plants are described as having red flowers, but the term "red" used here in the cultivar name misinforms those who have not seen it in flower. 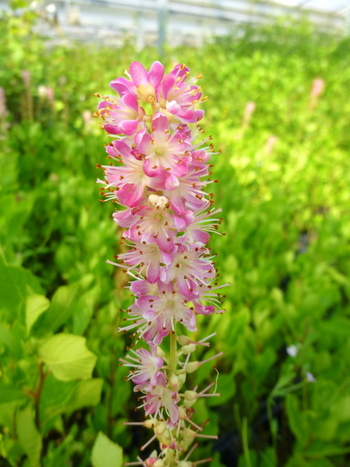 Many firms list flowers as "fuchsia pink". It's certainly not blood-red like Rosa moyesii, but this selection is a distinctively much brighter pink than seedlings. So it catches your eye - one of our favorites. Its flowers closely match the intense pink color of Prunus campanulata. 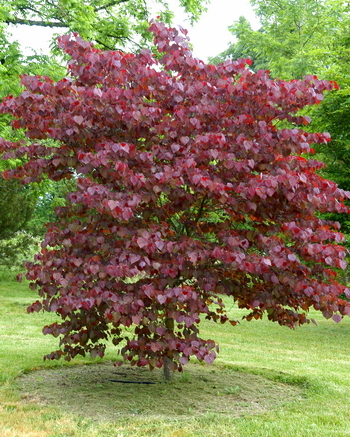 Popular variety with maroon-colored leaves. Flower color same as the species. Leaf color is darkest when planted in full sun. Hearts of Gold' is the first of several new yellow-leafed redbuds. 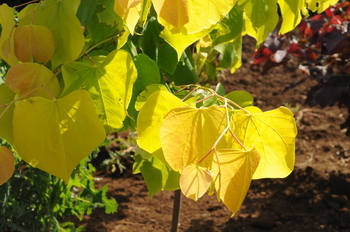 Its neon-yellow foliage is an immediate contrast in any landscape. Upright growth like the species; no leaf scorch in summer. 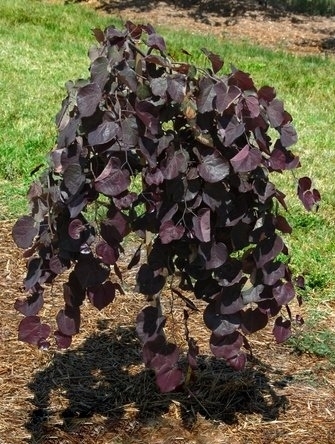 Result of a 'Forest Pansy' x 'Covey' cross, this is a hardy, compact genetic "combo" of purple foliage in a redbud weeper. If you don't mind staking it until it gets to 8 ft. or more, it will reward your efforts with small stature and clearly unique character to make your clients proud. This is another Ray Jackson section for very dark purple foliage which, in the right light, appears black even in our cool Oregon climate. It is going to bring a lot of excitement to this market and will create great value for the garden center trade. Lavender flowers. Supply is very limited. 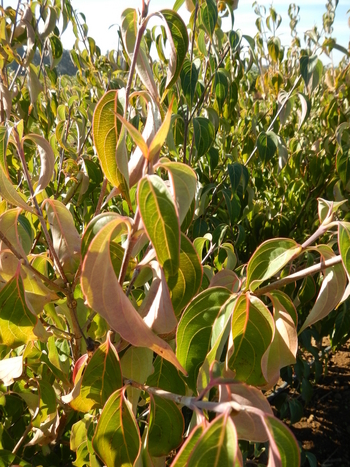 A new selection that has proven itself with excellent color retention and added resistance to summer leaf scorch than older maroon-leaved cultivars, especially in the heat of the South East. Rosy-purple flowers are followed by red-purple new foliage turning to wine-red burgundy in summer that holds well throughout the fall. Selected by Ohio tree connoisseur Tim Brotzman. Strongly weeping tree with masses of lavender-pink, pea-shaped flowers in late spring. Dark green, glossy summer foliage. Introduced by Ray and Cindy Jackson. 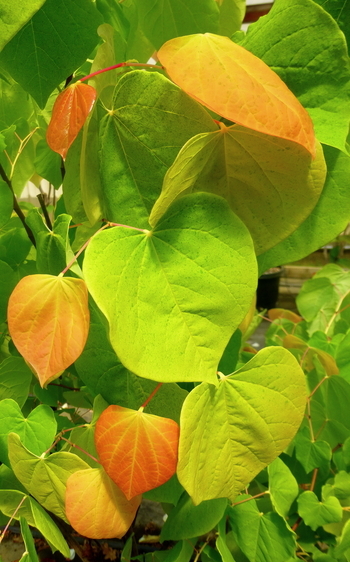 New growth has a light, Pumpkin-orange tint that distinguishes it from the uniformly green-ish-yellow color of 'Hearts of Gold'. In the heat of the Midwest and SE, it doesn't burn; that just makes it grow faster. We think you'll be amazed at its incandescent attractiveness, whether in a wholesale nursery or potted up for direct sale in a GC. As the common name implies, it's better adapted to heat and drought, and is a little smaller in mature stature. Bright pink-red flowers. 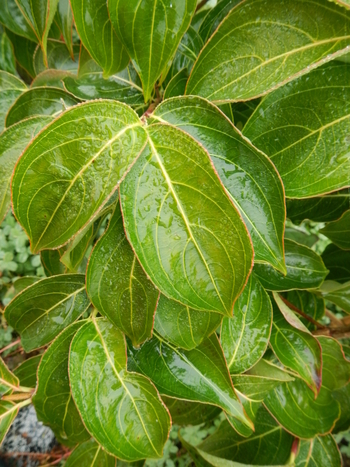 The leaves are rounded and attractively shiny. 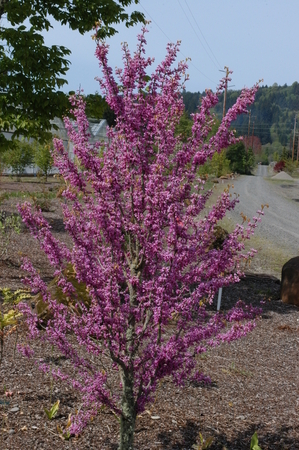 A phenomenal new development in redbuds with fully double, bright pink flowers more reminiscent of a flowering cherry than anything you know as a redbud. Truly remarkable. Long blooming and sterile. In other regards growth and habit are as you expect. All Chinese redbud varieties are covered with flowers in early spring -even on old branches. This cultivar is more tree-like, has bright rose-purple flowers and shiny leaves. Less hardy than C. canadensis. 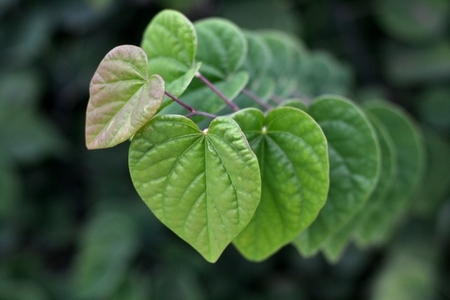 Heart-shaped light greenish gray leaves cover the thin brown branches in early spring, turning a darker shade of green later in the season, followed by gold and red leaves in autumn. Flower clusters of showy magenta color. Drought adapted and tolerant of much heat. 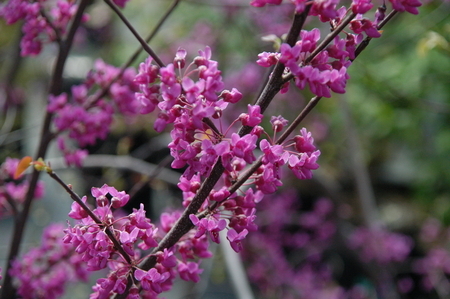 A relatively new dark purple-leaf cultivar, its Texas redbud parentage lends it more drought and heat tolerance, so it doesn't show leaf stress in the heat of summer. 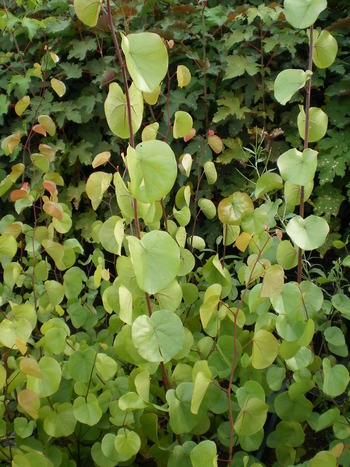 It has glossy, small rounded leaves, smaller than 'Forest Pansy', and it has an upright vase-shaped growth habit. Tighter, more dense habit than 'Forest Pansy'. 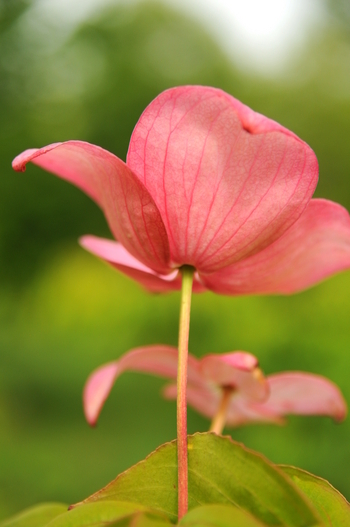 Mature plants flower heavily with strong bright pink flowers that produce few pods; This maintains a clean look tot eh tree later in the season. 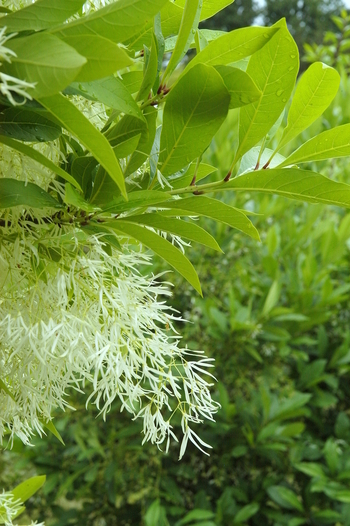 Like C. virginicus, Chinese Fringetree is an easily grown, small to medium tree. Flowers are borne at the ends of new shoots, weighing down the branches like wet snow. Few pests bother it. Always appealing across the seasons, the cinnamon-colored bark is most attractive in winter when contrasted against a snowy background. Even among experts, few seem to appreciate the distinctive character of this variety. We observe smaller, less glossy leaves that have serrate edges. Much flakier bark. Overall, the growth habit is more shrubby, almost bonsai-like for 10 yr. old 6 ft. seedlings. Flower character is essentially the same, so expect an abundant show of starry-white flowers at the new branch tips, followed by attractive blue olive-like fruit. Shiny dark green leaves and abundant, white, pleasantly fragrant flowers showcase this classy American native. Much hardier than C. retusus, it performs best in full sun and is remarkably versatile - from moist lowlands to dry hillsides. Among the finest of ALL landscape plants, not just natives. 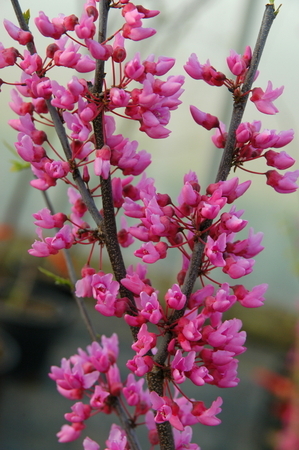 Still uncommon in cultivation, this is an exceptional ornamental tree. Like Wisteria, it is most noted for its drooping clusters of fragrant white flowers, touched with yellow in the center. Introduced into cultivation by André Michaux in 1796, its roots were chipped and boiled to yield a yellow dye for homespun fabrics before synthetic dyes became available. Adapted across a wide range of soil pH, it prefers a reasonably moist, yet well-drained soil with full sun and space to grow. Aptly named, its fragrant pink flowers are a delight to the senses. This plant delivers exceptional value in performance for price paid. It is a clean, easily grown plant worthy of a prominent spot where you can appreciate it. Extremely hardy. With attractive lacey foliage that is very sweetly scented this makes an attractive, colonizing, small shrub that should be planted where it can be seen closely and easily touched to release its fragrance into the air. It has a long history of medicinal uses but is seen less frequently than deserved outside the North East. 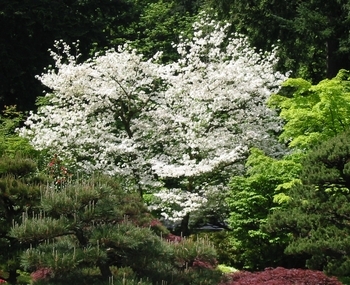 Large flowers, exceptionally fast hybrid growth, and tree-like form make this cultivar an attractive, under-used plant for the Pacific Northwest. 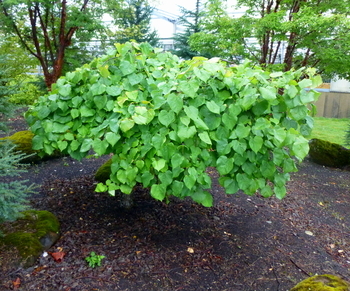 Shrubby tree with a prominently horizontal, tiered branch pattern, suggesting its common name. 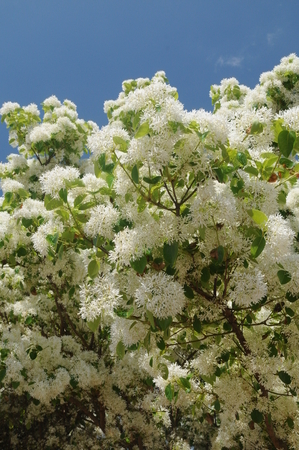 Flat clusters of fragrant May flowers add to its layered ornamental appearance. Blue-black fruits ripen in late summer, followed by bronze autumn foliage. 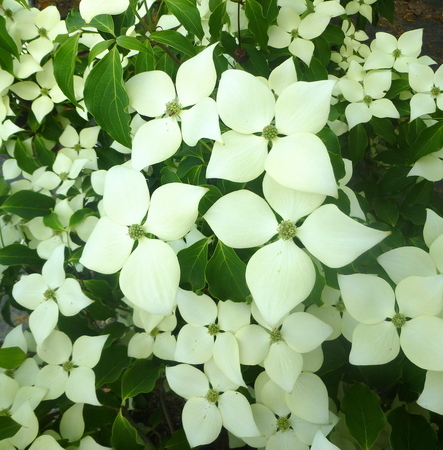 For the milder parts of the country this evergreen dogwood is a real show stopper. The foliage is deep green and contrast very well with the large, rounded, overlapping white bracts which nearly obscure the foliage. Easily trained to very nice tree form. Fine with strong winds and not bothered by pests. This handsome, wide-spreading Chinese tree reaches 30-45 ft. in height. It has a layered, horizontal branch habit, and showy 5-7 in. clusters of small white flowers that precede purple-black fruits in the fall. 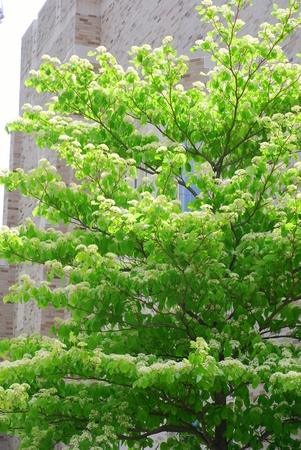 Taller and more tree-like than its American cousin, Cornus alternifolia. 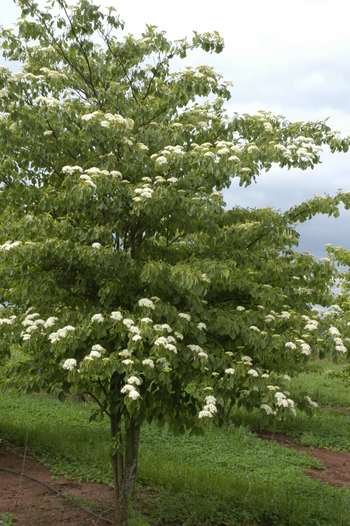 An evergreen Chinese Dogwood with a graceful, yet vigorous habit and loads of flowers. Each branch holds dozens of white blooms that eventually transform into translucent strawberry-like fruit. Empress of China will light up your partly-shaded garden year-round color and excitement. It relishes heat. Beautiful small American native with tiered branching. Wonderful floral display of white flowers and great fall color. Despite the enormous number of named selections out there, when one sees seedling specimens in the East in cemeteries or parks, there are always plenty of these that elicit, "Someone ought to name that one." Late-flowering form, essentially disease free. 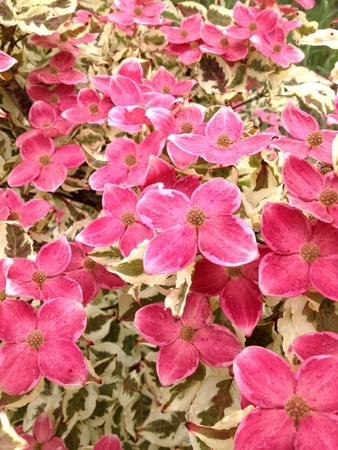 Deep pink to red flowers on this dogwood that makes most growers' top ten list. While Ragin' Red has the darkest red floral bracts of any C. florida it also has very dark red leaves, here in Oregon, nearly all summer long. Fall color is again red. So it really is in a red rage from spring until leaf drop. Rarely available; selected as a branch sport on 'Satomi'. It has white-variegated foliage similar to 'Wolf Eyes', but the flower bracts and foliage are irregularly specked with pink. 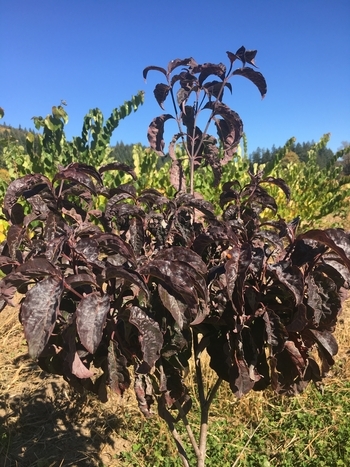 With irrigation it is not as susceptible to sunburn in Oregon, but reports from TN growers suggest that it may do best there in partial shade or on a north facing slope to protect it from the worst of late afternoon summer heat. Chinese dogwoods are described as having edible fruits, but they'd rank only behind wild persimmons as a snack option for most folks. However, when you see the double-sized, soft ripe fruits of this dogwood for the first time, you'll be tasting them if you have any curiosity at all. Fruits are relished by birds, branches laden with them to almost the point of breaking. 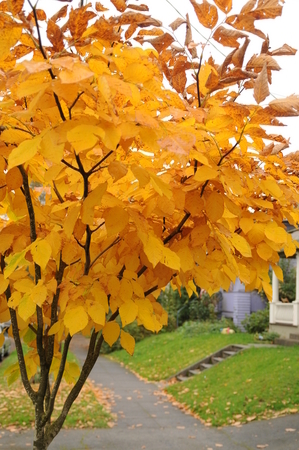 This tree is quite a remarkable sight in the fall. 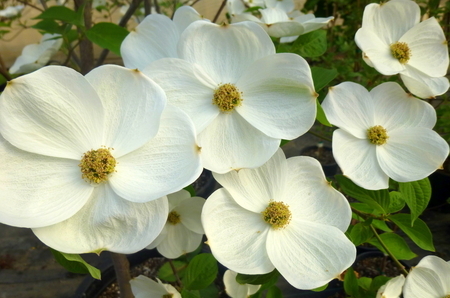 Cappiello and Shadow, in their book, Dogwoods, call it one of the very best kousa varieties. Our own experience and that of growers across a broad range confirms their evaluation. Strong growth makes it a great nursery plant, and its handsome foliage and abundant flowers give it universal appeal. Flowers suffused with a hint of green on cream. Heavy fruit set against deep green waxy foliage that turns to robust autumn shades of red and purple. Among the most prolific of all white-blooming kousas. These are vegetatively propagated from our original budwood accession - the original 'Milky Way' dogwoods at Wayside Gardens. After 50 years, the name is widely recognized and an easy sell to your clients, but pay no premium for Milky Way seedlings. Best known of the pink C. kousa selections. Flowers are a rich variety of muted pinks. Leaves also tinted with a bit of maroon, adding summer-long interest. Income potential matches its ornamental promise, as its growth is upright and strong. It is not patented, and almost never develops the disease problems associated with C. florida. 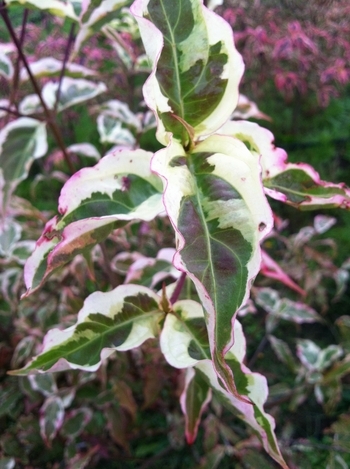 Introduced by Talon Buchholz, this brilliant, white-margin variegated clone seems perfectly sun tolerant and puts on a show to rival any of the daunting number of other white-variegated kousas. It is the most vigorous variegated clone we have grown. Crispin Silva of Crispin's Creations, Molalla, OR has a sharp eye for plants of superior ornamental merit. This selection from him has an auspicious future and ours were the first ever offered to the wholesale trade. 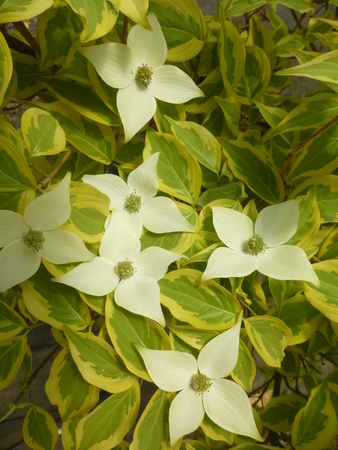 Distinctly upright in form, as opposed to the other gold-variegated dogwood, 'Gold Star'. Its uniform yellow variegation, unwrinkled leaves and strong growing habit qualify it a money-maker.